How Should Universities Respond to Racist Incidents on Campus? | Democracy Now! How Should Universities Respond to Racist Incidents on Campus? senior at University of Oklahoma who is majoring in African and African-American studies. He participated in the protests against the Sigma Alpha Epsilon fraternity after a leaked video showed some of its members singing a racist chant. president and CEO of The Louisiana Justice Institute. executive director of the Center for Constitutional Rights and part of the Ferguson Legal Defense Committee. In the wake of the University of Oklahoma expelling two student fraternity members for leading a hateful song, we host a discussion on how academic institutions should address racism on campus. We speak to University of Oklahoma student Rashid Campbell, Tracie Washington of The Louisiana Justice Institute, and Vincent Warren of the Center for Constitutional Rights. Click here for Part 1. NERMEEN SHAIKH: The University of Oklahoma has expelled two student fraternity members it says led a racist song caught on video. Members of Sigma Alpha Epsilon are seen on a bus singing a song that includes a racial slur and a vow that no black people will ever join their group. 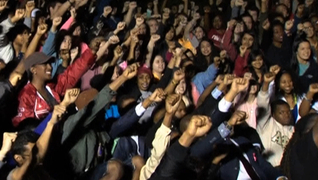 The school says the two students who allegedly led the song were expelled for creating, quote, “a hostile learning environment” and that all those involved, quote, “will learn … it is wrong to use words to hurt, threaten, and exclude.” Hundreds of students have marched at the school in a show of protest against racism. AMY GOODMAN: We’re joined by three people to have an interesting discussion about where we go from here. Joining us from Oklahoma City is Rashid Campbell, senior at University of Oklahoma who’s majoring in African and African-American studies. He’s been participating in the protests against the Sigma Alpha Epsilon fraternity over the racist song. Last year, he won the National Debate Tournament, becoming the first African-American to win the title in the 67-year history of the tournament. It’s a nationwide debate tournament. He beat out over 160 other contestants. Also with us from New Orleans is Tracie Washington, president and CEO of The Louisiana Justice Institute, leading civil rights attorney in New Orleans. And here in New York, Vince Warren is with us, executive director of the Center for Constitutional Rights. Now, the president of the university, the head of the University of Oklahoma is the former Senator David Boren. He has expelled the two students who are caught on the videotape, though it looks like there’s a whole chorus in the bus who are singing this song. This is part two of our discussion. Rashid Campbell, what you think needs to be done? Just two students were expelled, the two particular—were they actually members of SAE, or were they pledges being told to sing this song? RASHID CAMPBELL: From my understanding, they were freshmen. And I’m not sure where in the process they were. But I believe they were initiated within the fraternity. So they were a part, but they were freshmen, to my knowledge. AMY GOODMAN: Do you think that just the two who were leading this song should have been expelled? What should happen with the other people in the bus? Sounded like there was quite a chorus there. RASHID CAMPBELL: Right, right. I think it’s a combination of two things. The first thing is I think there needs to be an expulsion to be symbolic in the ways that the University of Oklahoma is standing against injustice and racism as a whole. I think the second part is the education that we were speaking about before and the ways that we can conduct racial sensitivity courses or things that we can have conferences and meetings to where people who had not been exposed to knowledge around not perpetuating racism can be exposed. I think that it is the part of—the part of the responsibility is twofold. It is on the students, and they must be responsible for what they said and what they participated in. But it’s also on the history that has created that chant. They weren’t the inventors of this chant, and this is well known knowledge. So we need to put an onus on who invented those things and how can we stop that from perpetuating itself. NERMEEN SHAIKH: Vince Warren, I wanted to ask you about that. It was obviously one of the fraternity members who was expelled, Parker Rice, said in his public apology that he was taught this song. “We were taught this song.” Of course, SAE, the fraternity, denied it, saying, “The national fraternity does not teach such a racist, hateful chant, and this chant is not part of any education or training.” So could you say a little about how widespread you think this phenomenon is, racism that is embedded within these institutions? AMY GOODMAN: And explain who Bernard Lafayette is. VINCENT WARREN: Bernard Lafayette was a longtime activist that was dispatched to Selma, Alabama, to try to figure out the strategy for desegregation and to change the foothold that they had in Selma. And, in fact, SNCC had said that no change could come to Selma, because the black folks were too scared and that the white folks were too mean. But Bernard Lafayette told this story about, in Selma, they didn’t have to drop any—they didn’t have to put off any bombs like they did in Montgomery. And, in fact, the White Citizens’ Council didn’t meet around a burning cross, but they met in the bank. And the reason why that’s important is because this conversation is not just about people having a discussion on a school bus. This is about having a conversation in the context of a structural system, which is a fraternity. And that’s a huge problem. You have to imagine that this is something that is taught to other people, and that is part of what that fraternity’s history is that they need to disavow. And I think, you know, probably the more important piece here is that if this had happened in the context of a school debate, if these folks had said, “We want to have a school discussion that says black folks should not be allowed in SAE,” I think that is protected under First Amendment activity, and that is a discussion, and that’s the learning moment. But that’s not what happened. Here, we had people on the bus that it’s perfectly fine to say these things amongst themselves, and it’s perfectly fine to put them up on the Internet, and then we’re going to be washing our hands and trying to figure out where’s the structural problem here. This is endemic in this institution, in that fraternity. And I think that the president did the right thing, particularly about taking the fraternity letters down. And that fraternity needs to be investigated nationally, because we were going to find that this is a problem not just in Oklahoma, this is a problem everywhere. AMY GOODMAN: I want to turn to the University of Oklahoma president, the former Oklahoma senator, U.S. senator, David Boren. DAVID BOREN: This is not our way. These are not our values. This is not who we are, and we won’t tolerate it, not for one minute, from anybody. So, those students will be out of that house by midnight tomorrow night. The house will be closed. And as far as I’m concerned, it won’t be back, at least not while I’m president of the university. AMY GOODMAN: So they’ve closed SAE on campus at the University of Oklahoma, and the two students caught on the videotape leading the chant have been expelled. Tracie Washington, you feel this, though, you are—you condemn what they sang. You feel expulsion is the wrong answer. TRACIE WASHINGTON: I feel expulsion is the wrong answer for lots of reasons, and so I’m going to disagree a little bit with my very dear friend Vince Warren, to this extent. Too often, we take this, you know, sort of all or nothing, we’re going to make this expulsion, we’re going to take down these letters, and then we don’t do anything else, and we don’t really confront the roots of the structural racism. And that is also the tolerance that was also going on in that community around what was happening inside that fraternity. So let me be really clear. We get students at school who are not fully formed. I’m an adjunct professor at Dillard University. I deal with issues on college campuses in my practice. We know that we have to form and make better people. The teachable moment—the teachable moment for President Boren was to sit back, take a deep breath—a hard, deep breath—and swallow and say, “You know what? This isn’t only SAE. SAE has got to go, most certainly. But there were faculty members, and there were administrators on my campus who knew what was going on at SAE.” We don’t have a mouse problem,” as I said in my blog. “We have mice. And we’re going to exterminate this vermin that’s called racism not by hiding it, not by putting out one trap. We’re going to teach this entire community about anti-racism. And even those students who we know were singing and chanting, and have those thoughts, and the ones that we don’t know, because we can’t identify all of them, we’re going to teach all of them.” And that’s what leadership is on a college campus. And it’s hard. Now, the expulsions have taken place. If we want to call them symbolic expulsions, you know, I’m not the president, and I’m not Rashid, and, God bless, I’m not on that campus. But what has to be done is for that university to understand it’s not just those two young men. It’s not four young men. It’s not just that fraternity. It’s the entire community. Structural racism is not just the racism that was there, but what had been allowed by the University of Oklahoma. Hire a chief diversity officer. Ensure that every student, faculty member and administrator over the next two, three years—year, if it were up to me as the chief diversity officer—undergo anti-racism training. Universities are here to teach and to make better people. And on that, right now, right now, I’m going to give—as a college professor, I’m going to give President Boren a C-minus. NERMEEN SHAIKH: Rashid Campbell, could you respond to what Tracie Washington said? And also talk about the protest that you helped lead outside the president’s office. RASHID CAMPBELL: Well, firstly, I agree with a lot of things that Tracie said. I think that this is a historical problem, and I do not want this to be a media frenzy for a week or so, and then, once we come back from spring break, we’re back at the university, we’re back on campus, everybody act like racism doesn’t exist anymore. I think that there needs to be some structural changes in the way that we engage racism and the way that we teach those who don’t know about racism on campus. The thing that, in response to specifically what Tracie said, is the only thing that I think is different from me and her, and it’s obviously just because I’m on campus and she’s in New Orleans, is that I think that President Boren along with other administrators on campus understand the safety issue. Right? I want everybody to understand that regardless of the expulsion, when I read the apology letter coming from both of those students, they tell—if I remember correctly, they said that they withdrew, right? I’ve also heard different perspectives from professors saying that they have received emails from some of their students, say that “I’m scared to come to class, because I’m a part of that fraternity.” Right? So it’s a safe space issue also for the other students that see SAE on the media being symbolically demonized and said—put in this such of a bad light, which, all in all, is something that they put on themselves. But it’s a question of how do we create a safe space on campus. So I think that that is a precedent that has been set. In response to what we did as far as the protest, there were two things. The first thing was the morning—Monday morning, I think everybody saw the video. The video leaked Sunday night, if I’m correct. Monday morning, we had a 7:30 silent protest, right? In the midst of that, I got up and spoke about the role of white students. One of the things that bothered me the most was that there were so many people, like we were saying before, chanting on the bus. Now, there probably was a few individuals—i.e. the person who was recording—that were uncomfortable with the chant, but for the most part, everybody was all in. And the question comes, is what is the role of the person on that bus that disagrees? What is the role of the person who sees racism in front of their face and does nothing? I think that they are a part of the problem. I think that everybody has a role. We need to understand that an inaction is in fact an action in itself. And if you see racism and injustice, and you do nothing, you’re only helping perpetuate that very system. And the second thing is that we marched in front of the SAE house. We wanted to celebrate the ending of that fraternity and the ending of us tolerating injustices at all. We don’t want there to be a stamp of saying we’re done with racism, racism is over, but rather a stamp of saying that I take a pledge to vow myself and understand that I am, in part, a role in all of these structures, and I must take onus on what I can do to stop perpetuation of racism and injustice whenever I see it. AMY GOODMAN: Vince Warren of the Center for Constitutional Rights? VINCENT WARREN: Yeah, I think that Rashid and Tracie lay out a very nuanced approach to this, and I want to complicate it a little bit more, by two things. I want to talk about the president—the basis for which the men were expelled. And one of them was creating a hostile environment on campus. And I also want to address what Rashid said about creating a safe space. And while those frameworks work really well in some contexts in discrimination, like in employment law—you don’t want to have a hostile work environment. And of course you want to have a safe space so people can exchange ideas. I think that’s important, and it’s key. However, we have to be careful about the way that we’re framing these discussions, because what we don’t want to do—and I think both Tracie and Rashid would agree with me—is we don’t want to create such an environment that people are not honestly and openly exchanging their ideas. And so, the idea of the safe space and the hostile campus environment, of course, is the same framework that’s used by universities when trying to tamp down against pro-Palestinian activists or people that are challenging Israel. That’s the first place that they go: It’s not a safe space for the Jewish students on campus; it’s creating a hostile campus environment. And that’s why I think that it’s important to have these longer-term discussions, because there is no simple solution to structural racism. But one thing that we have to do is we have to be nuanced and fair as we think about what the ramifications of these things are. I think, finally, you know, the challenge is—I have a 17-year-old that’s going to college next year, as well, and I don’t want to see him—I don’t want him to be at a school where there’s a fraternity where they’re saying black folks can’t come on. But at the same time, I’m thinking about how he would engage that and how he would build a core of friends who would be able to push back against that. And I think that Tracie is right that the conversation—and Rashid—that the conversation needs to happen on campus. But I also think that the president is right in saying that—in cutting ties with the head of the beast and cutting ties with the beast, as well, to send that message that there will be accountability for when people cross the line. I wanted to ask Rashid this question. With Parker Rice, who said, “I made a horrible mistake by joining into the singing”—he wasn’t the only one—”and encouraging others to do the same,” so if you’re for the expulsion of these two students, but also know you want to deal with structural racism on campus, what is being set in place? Not only what the president, David Boren, has said, but as you come back from spring break, what will happen? RASHID CAMPBELL: My hopes for what will happen, well, first off, in response to Mr. Rice, I think that there is a very uncomfortable—it’s an extremely uncomfortable situation, and I think he’s embarrassed. And I hope that the apology is genuine. I want to say that on behalf of many people, because I feel the sentiment that folks feel on campus is that you’re apologetic because you got caught, right? And the question is: Are you truly apologetic because you understand what you said was wrong, or do you understand that you shouldn’t have been saying those things or believe those things in the first place? The second thing I want to say as far as after—you know, post-spring break, is that my major, for instance, African and African-American studies, the AFAM department, is a major that is not tooken, or taken, as seriously as I believe it should. The funding that’s towards it is not as much as it should be or as equal as other departments, for example. When we have conversations about race, I want to point out that there are many amazing professors at the University of Oklahoma that do teach about structures of racism and how to deconstruct those things inside your own life. I think there needs to be more scholarships, funding and general money put towards, I guess, the precedent or the serious situation of how racism sets itself up not only as a structure, but how people can perpetuate and linger onto those structures without having any repercussions. I think that we have departments that are trying and attempting to do those things, but they are not being supported as much as they should. And I think my major is one of the examples. So I think that that does a lot. And I think we need to have other strategies, as well. But I think that if that comes—like Tracie said, the university is a learning ground. The university is where students become actors. There was a meme going around saying—they took a picture of the kids on the bus and said, “Listen, these are your next senators and governors,” right? And although that can be funny, a lot of it is truthful, right? The people that we are at the university with are going to be the next, you know, President Borens, senators and etc., etc., right? So if we are not training these students in the ways that they should engage with society, which they inevitably will, then we’re only doing an injustice for ourselves. So I feel like that is the best strategy as far as, you know, solving for the structural racism. AMY GOODMAN: Tracie Washington, your response? TRACIE WASHINGTON: I appreciate what Rashid just said. Look, I’m a parent of a college senior at Grinnell College. And all colleges, big and small, deal with this. Vince, call me; I’ll give you some advice on it. But at the same token, you know, we understand, Amy, I can’t judge these 17-year-olds who have done this horrible thing and made these chants—and I’m talking about the two that have been expelled—by the same standard of myself, understanding anti-racism. And so—and I’m coming from that perspective with all of these things and all of these hats that I wear. They’ve got to learn. It is a space where students need to learn. They are 17, 18, 19, 20 years old. I’m not going to excuse in any way—we can’t excuse what they’ve done. But we’ve got to teach them to do better. And to Vince’s point and the big point that I made, at least in the beginning of my blog post, I want everybody to understand that we are also dealing with a public university, not a private college or private university. There are rights here that must be afforded students. If we are expelling them simply because of what they said and how offensive it is, I’m going to be then concerned about what happens when that Z-Phi-B, Zeta Phi Beta, student comes in and says something that other people may find offensive about a white sorority. You know, I just want us to breathe a second, Amy, and understand that when we’re dealing with racism and teaching against racism, it can’t just be one small segment here. It’s huge. And it takes a lot of work. And I don’t know yet whether that university is really prepared for the work that’s going to be involved in anti-racism on that entire campus. And I want that for you all, Rashid, because next year this will happen. It’ll happen tomorrow; you just won’t hear about it. And President Boren has a phenomenal opportunity right now. I want you all to look upon this, after spring break, as an opportunity, to reach out to those of us in civil rights and doing this work, to say, “Help us. You know, we want to make our university better.” And truly, truly, you guys can be that beacon that also leads other universities in getting it right. Getting this right, it’s so incredibly important. They will be your senators, your next senators. You know, they will be your next congressmen. And so, we’ve got to make you all better. AMY GOODMAN: Final comment, Vince Warren? VINCENT WARREN: I think we’ve really encapsulated some of the real chief challenges that are here. And my thought is, as Rashid and Tracie point out, it’s about balancing what we were trying to build moving forward with what are the steps that are necessary right now in this moment. We have a challenge in social media, where stuff comes up immediately, people have immediate reactions. But I think, ultimately, I go back to Bernard Lafayette in Selma and says—that says that, essentially, the bravery of the moment is how we act—how we stand up to injustice, how we act and move towards that, and what kind of systems are we building to correct it. AMY GOODMAN: Before we end, I wanted to bring up another issue. I wanted to turn to Amy Ziering, who’s the producer of a new film called The Hunting Ground, which exposes how colleges nationwide cover up sexual assault on campuses. In the wake of the release of the racist video, Amy Ziering told CNN that this fraternity—on the campus, you know, of University of Oklahoma, but is a nationwide fraternity, SAE—is also known across the country for sexual assault. AMY GOODMAN: So that’s Amy Ziering, who’s the producer of The Hunting Ground, about sexual assault on college campuses. Bloomberg has also called—Bloomberg News—has called SAE the deadliest fraternity, after finding there were nine deaths associated with SAE events between 2006 and 2013. Those deaths include George Desdunes, a 19-year-old black student from Brooklyn, New York, who had his hands and feet tied with duct tape and zip ties during a hazing ritual. He was blindfolded and given so much alcohol, he died. Tracie Washington, you’re a civil rights attorney in New Orleans. You’re an adjunct professor. You are CEO of The Louisiana Justice Institute. Had you known SAE in other contexts? TRACIE WASHINGTON: I’ve known about the fraternity in the context, unfortunately, of the sexual harassment and sexual assault cases, doing Title IX work in my private practice and consulting with schools. And I can almost make the same analogy about what’s going on now with this race and racism issue with SAE as I could with—and trust me, it’s not just SAE—with fraternities and fraternal organizations throughout this country and tolerance. My concern is not only about the horrible sexual assault issues that are encapsulating and consuming many of these schools. It’s the reactions of the schools and the communities. It can happen only when there is tolerance of bad behavior. Time and time again, not only do I hear about what has happened, and investigate and learn, you know, about what’s happened with just the actors, but also who knows about it in the fraternity, who knows about it outside the fraternity and in other fraternities and sororities, who knows about it in staff, because there’s staff inside these houses. We saw the brother who was the cook inside the SAE at Oklahoma. Who has he been speaking with? What administrators then now know? And what bothers me, what angers me, is that it’s being tolerated. And I don’t want us to leave this conversation about anti-racism, race and racism on campuses, and sexual harassment and assault on campuses, without also putting responsibility on communities, administrators and faculty and staff, to, when they hear about it, do something about it. And that’s not happening. I don’t put it all on the students. Students get scared. They’ve got some responsibility, but there’s fear in that community. The grown-ups on the campuses, they have a higher calling and responsibility and duty—in some instances, legal duty—to do better. And they’re not. They’re failing. AMY GOODMAN: Well, we want to thank you all for being with us, Tracie Washington, president and CEO of The Louisiana Justice Institute; Vince Warren, executive director of the Center for Constitutional Rights; and champion debater, Rashid Campbell, a senior at the University of Oklahoma majoring in African and African-American studies, who participated in the protest against the Sigma Alpha Epsilon, SAE, fraternity after that leaked video showed some of its members singing this racist chant. This is Democracy Now!, democracynow.org, The War and Peace Report. I’m Amy Goodman, with Nermeen Shaikh.